How did the story begin with you walking around with tourists in Bucharest? Bucharest Walkabout Free Tour is in this moment a group of 7 friends that love traveling, travellers and Bucharest itself. We are expanding our team so, more friends to come:) We are organised as an NGO that tries to develop more and more projects related to Bucharest's discover journey. It all started as an experiment. We felled in love with the concept in Amsterdam - very inspiring location - and took the challenge to start our own free tour, the most special, friendly, interesting and fun for travellers that took the challenge to discover Bucharest. So, in 2011 we started to read, meet, ask, explore, walk and finally we've created the tour. The first tours were quite interesting - with 1 tourist only - but we learnt more and more and kept our promise to be there every day no matter the weather and to make the best of it. We liked so much the tours that we cannot stop them, and from a hobby, everything grew with a lot of passion and hard work so much, that part of us are now thinking to work in tourism for good. 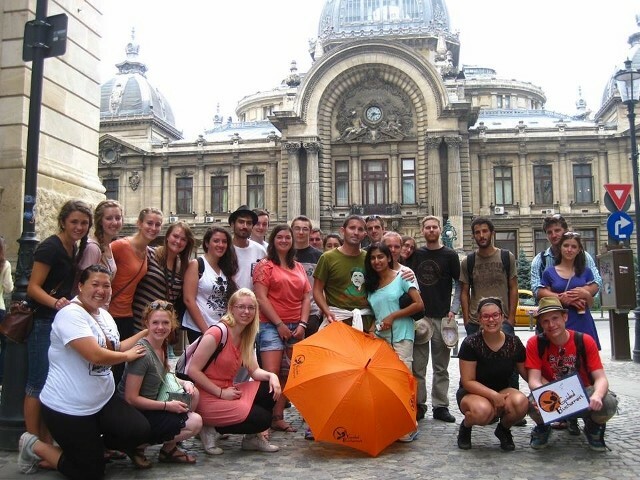 Why doing a free Bucharest tour? There are two main reasons: one is because we really like Bucharest with its endless hidden stories and dynamic rhythm that deserves to be shared, and the other one is because we like having guests and making friends every day from all around the world. Also, the free tour gives you the opportunity to evolve, to express freely and interact with so many different perspective in just a couple of hours. How did you choose the route? We first thought of the main sights that tourist are interested in, but we also wanted to get the chance to share with them some stories that are more special, and most of the time unknown, and to be able to see and understand the actual dynamic of the city. Our main challenge was to find a chronological path through the city, in the mixed architecture and continuous mingle between old and brand new. Still, this open attitude about good and bad decisions that changed the city face is truly appreciated by tourist and locals as well. We've tried also to design a tour that talks about diversity, linking more types of attractions and places with different purposes and signification. Also, we have adapted the tour in time, optimising it based on experience and people reaction along the way. Big yes! For us it is a very important and exciting mission to actually be there waiting for our guests no matter the weather or if anyone announced before their presence. And also you never know what to expect: they might be 30 or just 1, you could gather all 5 continents or maybe the majority are Romanians. 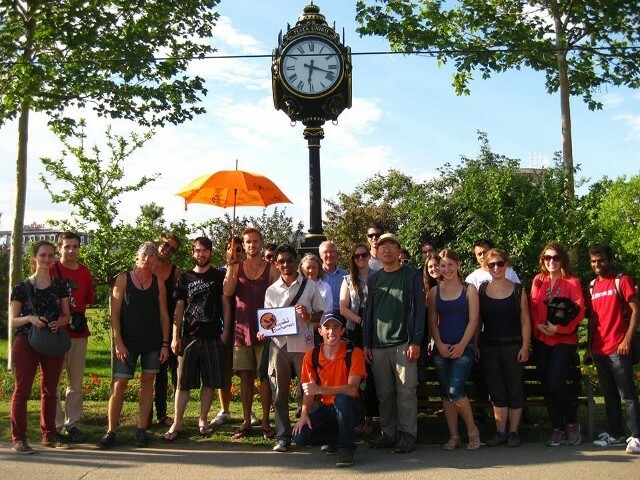 We will have our orange T-shirt or umbrella and the Free City Tour Sign and wait for people to come. And also, this is quite an important responsibility that we have, but it is a great feeling to know that travellers can rely on you no matter what. What is the tourists’reaction generally, what are the things they do appreciate? The majority of the tourists are surprised in a good way about Bucharest in general, seen as a dirty and insecure location from outside. 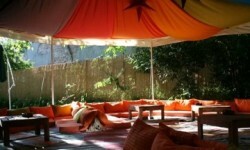 They are surprised to see so many beautifully houses and the wild rhythm around the Old Centre. They appreciate the fact that we are open and we like answering their questions. Also we like to think we are funny, and in this way able to make the tour engaging and fun. I guess our reviews are summarizing best their appreciation toward us, most of the people using words like: enthusiastic, informative, honest, knowledgeable, fun etc. (see more). 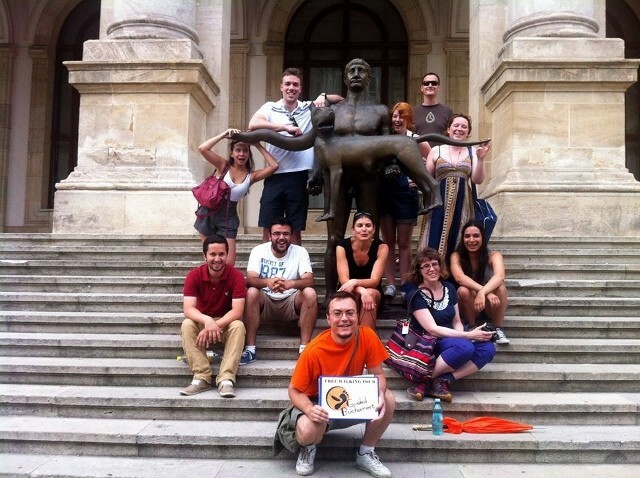 That's how we managed to be the best walking tour in Bucharest according to Trip Advisor. What kinds of tourists join you usually and from what countries? 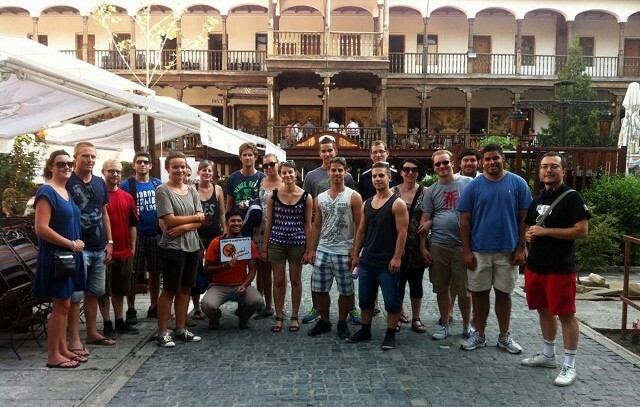 The tourists that are coming to our tours are curious and active. They come to the tour and find out about the city but also they manage to leave together for a beer. Most of them are young, solo travellers or small groups that want to explore more, but we have older persons or family with kids also. As for the main countries we have a saying that we will not start the tour without an Australian, as they are really well trained travellers. Also US, Western Europe, Latin America and Asia are in top. What is the most interesting story experienced by now within this project? This is a difficult question, as each of the guides have their own stories and met hundreds of people. What we find interesting is the life stories of our guests that are travelling for years or just to quickly escape from the office, which are volunteering or working, discovering new or rather old things, and so on. For instance, we’ve got a request for translating a really old letter from Romanian in English from an incoming tourist that looked for his origins in Romania, or for reaching the ” gipsy offices” in order to find out their future… And the stories could go on for a while, as we’ve managed to gather many interesting ones. And that’s another reason why we like doing the tours, meeting people and get new friends. 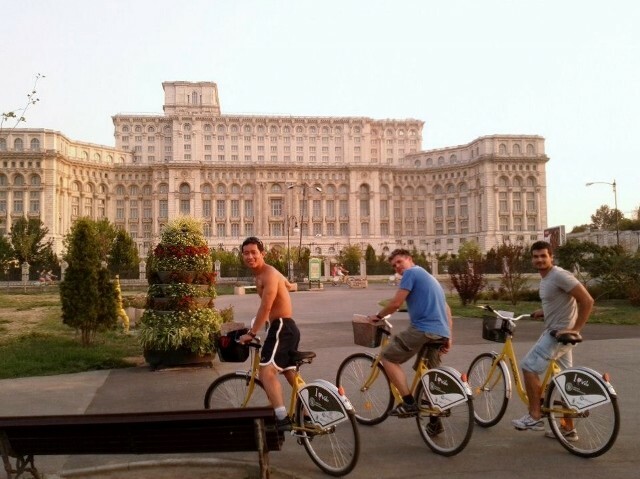 What is the specific of you Bucharest bike tour, why is it special? 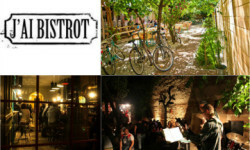 The Bucharest-city of contrasts Bike Tour is special as it manages to find a green path in the crowded city, combining diverse places, stories and ultimately experiences. Most of the tour is taking the tourists in green areas, shady, but also showing many sites, both touristic and hidden, speaking about diversity from different angles: landscape, museums, neighbourhood evolution, monuments, food or art. It is a much loved tour for both tourists and guides, as it really uncovers the reason why you like or hate Bucharest: its contrasts. 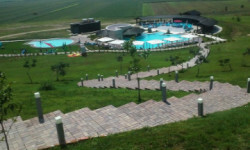 Other points that define why this bike tour is so great are best reflected in the reviews and people’s feedback that, for instance on Trip Advisor, climbed this tour in the top, being number one tour in Bucharest. The experience at the tour is really engaging as the guides share with the tourists around four hours of knowledge, friendship, a short snack in the park and insights about Bucharest evolution and its present vibe. It’s active and enthusiastic so I think it is a really nice surprise for bikers all around the world. What are the feelings of the tourists after doing the tours with you in Bucharest? What are the places they found the most attractive?